Great little video Dave, he seems so confident and relaxed saying you just got him.love it when they they inquisative like that. Really Glady Katy likes him too. Getting dry in the basement, but I have been misting Feliz's tank 1X a day to keep humidity over 60%. His water bowl is evaporating pretty quick too. This will not be an issue when his Boaphile comes, but I have to do what I have to do now. I went in tonight to change his water bowl and mist. I took him out for a minute, sprayed the tank, took a quick video and a few pictures, and back he went. I still say, "WOW," every time I see him! Only been a couple of times now though; been leaving him alone to settle in. I am attempting to feed on Tuesday night. I'll report. He's really calm. A tiny bit hesitant when first picked up. Not defensive or anything, but you can tell from his body language, he's thinking, "I think I am okay, but, not 100% sure." 1 minute later, he's exploring and seemingly happy, calm, and curious. Cool little guy. With time, and continued gentle handling, I am sure he will become more like Behira. Once out of food mode, she's like, "oh, okay, play time!" No minute delay for her anymore. She's ready to rock and roll right away. I still cannot believe, given his limited handling, and his size and age, how incredibly calm, AND, curious he is. 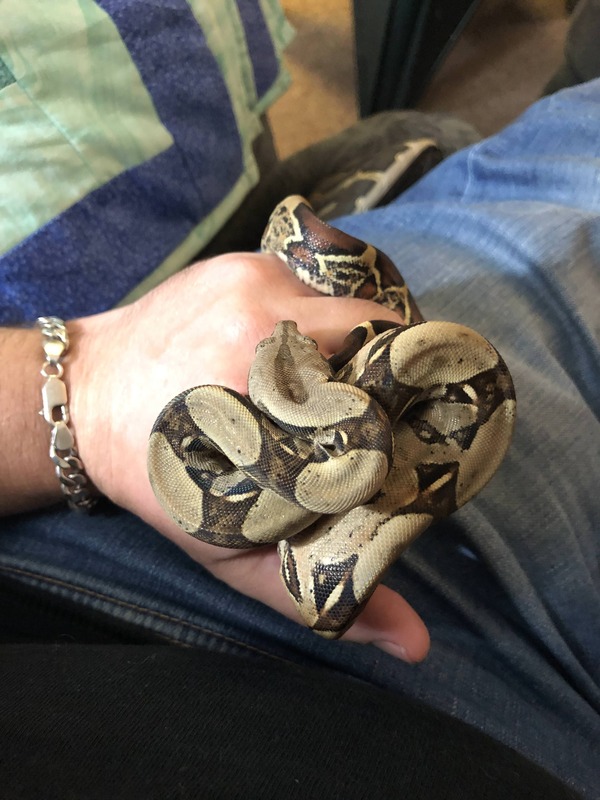 He's going to rock as a bigger boa. Last edited by dakski; 11-10-2018 at 08:23 PM. I know I "said" I wasn't gonna look any more, but I lied... he's adorable! If it makes you feel any better, I never believed you when you said that you, "wasn't gonna look any more." 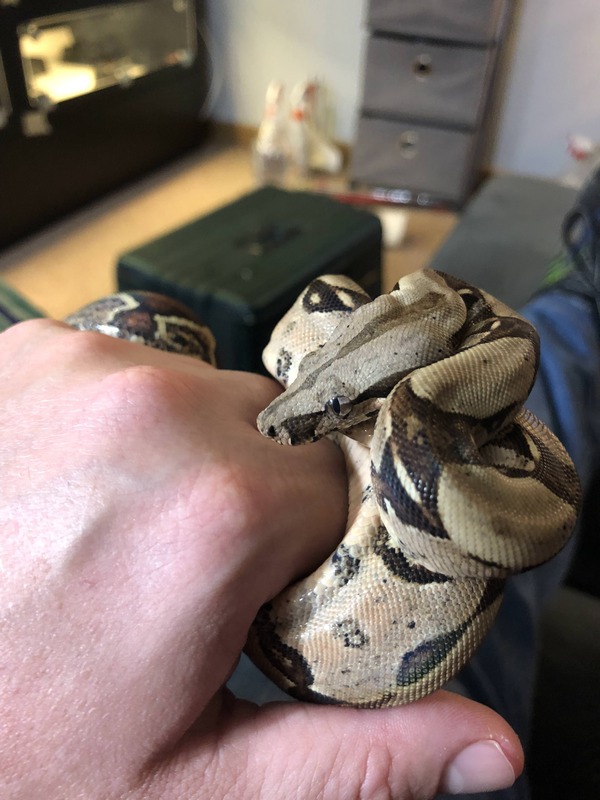 He’s such a good looking Boa! Those colors are just so vibrant and he seems so docile in the video. I think you struck gold with him. I totally agree. I looker and a lover! What more could I ask? I offered Feliz food tonight (he arrived one week ago and it was feeding night for everyone else except Figment and Yafe, who is not quite ready to eat yet). He had been eating stunned mice with the breeder and never frozen/thawed (F/T). 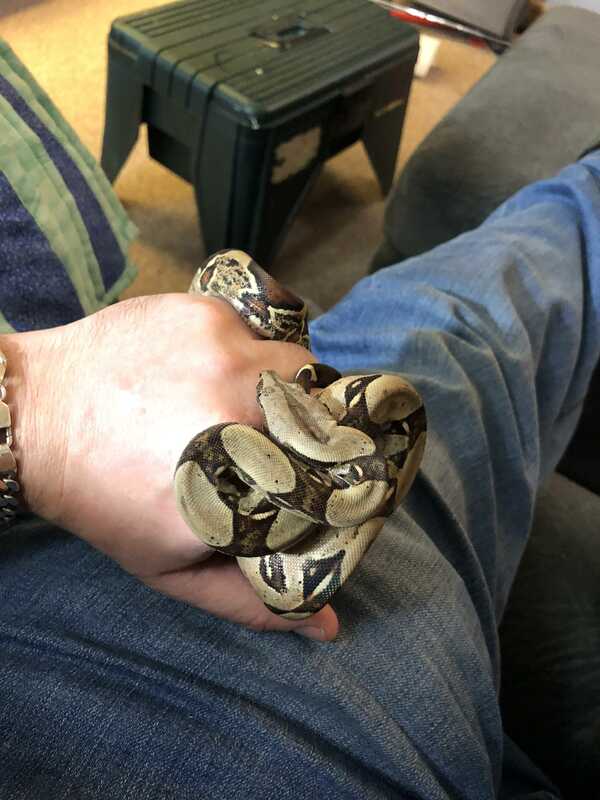 However, he's a boa, and I've easily switched young BP's from live (running around the tank live), so I really wasn't worried at all. Well, he happily ate a F/T mouse hopper. No issues going to F/T whatsoever. Kind of funny actually. I shook the mouse in front of his hide for a bit, but he prefers the spot on the hide further from the door. After shaking for a minute, I decided to put the hopper down with its head in the doorway and see if he came to investigate. I figured, if he did, I could pick it up and shake and get him to strike. Well, that was not necessary. 2 minutes later, he stuck his head out sniffing, nudging, and tasting the mouse. One minute later, it was in his mouth. Goofball grabbed it by the middle though and after about 5 minutes of gnawing on it, he bent the head under on the floor of the tank and swallowed the head with the midsection! Good thing it was a rather small meal for him (10G - I think he could eat a 12-14G weaned mouse pretty easy, but I'll keep it hoppers for at least the first few feedings). Once the head and neck/midsection area was down, the rest was smooth sailing. I should add that he looks like he might be starting to go into "blue" as well. 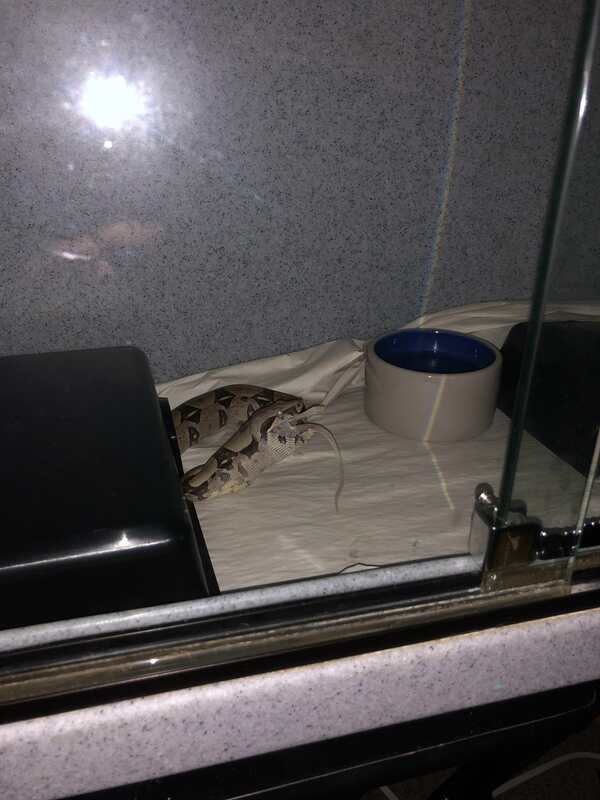 Difficult to tell with limited light (I feed with tank lights out and minimal room light - just enough to see the snakes and not get bit ). I think he's going to be a great eater. Picture below of last bit of hopper going down. When it comes to snakes and eating, I'll take a pig any day of the week and twice on Sunday! In all seriousness, I had zero worries. However, I wasn't sure it would be that easy. Congrats on his first feeding. Is always a relief when they first eat under our care. You know, I just realized that you got Feliz the same day I got Kenny. I will always remember that dakski. So don't be surprised when you get a PM from me on his first year anniversary with you; and you'll be like "how did Ricky remembered the day?"